Happy Spring Tuesday! It is finally the first day of Spring! Although I love the Winter, it feels like we have been walling in it forever. But don’t forget, just because it’s Spring doesn’t mean it is time to pull out those booty shorts and tank tops. Spring is the season of transition from the cold to warm weather. So let’s be a bit more patient. 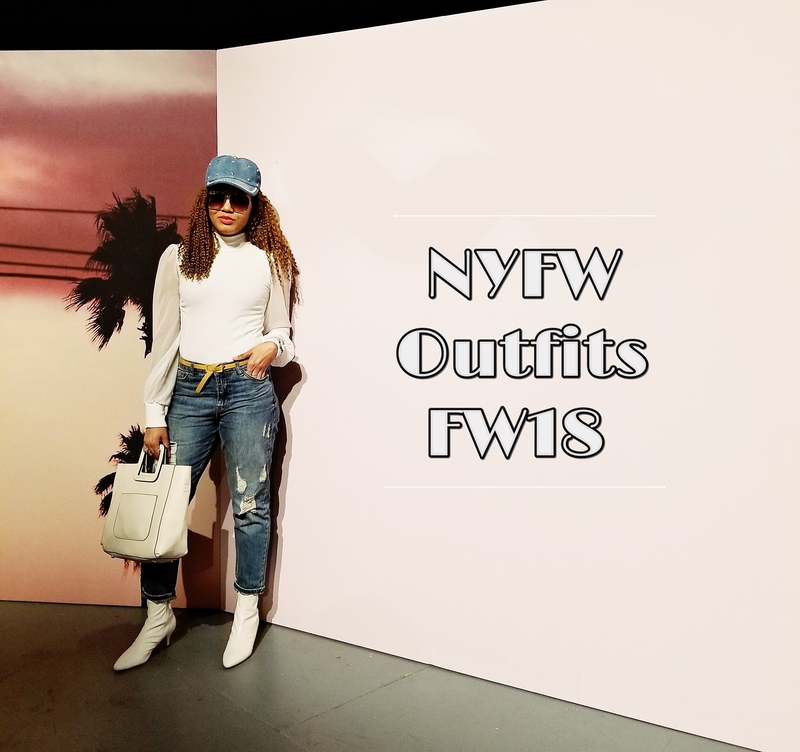 Other than that, I have finally finished compiling my recap of outfits for NYFW FW18. Hey, better late than never right? So just scroll down to see my looks! I guess I was going for a groovy vibe here. Honestly, I didn’t put much thought into the look because I was pressed for time. But the outfit came out great though! A nice fuzzy, chic sweater paired with statement striped trousers to create a streamlined look. If you know my aesthetic, I love a splash of color. So a pair of wine booties and a mustard yellow clutch were made in matrimony. This was one of my favorite looks! I had finally got to wear my first new pair of girlfriend jeans for Fashion Week along with my mesh puff sleeve blouse. Creating a sport-luxe look with a touch of sophistication by the pearls on the cap. And I wasn’t afraid to rock so much white. I guess three times a charm. Another sport-luxe look here but more casual to the outfit prior. I was crazy to wear white pants because it was raining on this day. But I made it work. I went for a semi-monochrome palette, embracing the textured greys (once again, three times a charm) while breaking it up with a neutral tone of white. I love blue and mustard yellow together, so utilizing the two in this look was the icing on the cake. Go bold or go home! This is what this outfit was about. I love the playful ruffles paneling down the leg and paired it with one of my favorite sweaters which has a beautiful zipper aesthetic down the back which you can’t see here. I kept it dressy with a pair of pointy kitten heels and a cocktail purse. But finished it off with a smack of edgy with a shearling coat. This look was another one of my favorite outfits. I focused more on shades of blue palettes layered and accented by black and white. What I love about this outfit were the stylistic elements at one time. It was polished, casual, feminine, dressy and edgy simultaneously. Another bold moment in monochrome red with a pop of white inspired by Valentine’s Day. It was definitely a showstopper because you can’t ignore a color like red when it’s all in your face. Also, I wasn’t kidding about this red coat as you may have seen in my previous posts, I wore it on my birthday and a few times during Men’s Fashion Week. I mean, can you blame me? The last day of Fashion Week was quite fun. I didn’t attend any shows. which was fine because I was tired anyway. But I attended a couple of parties. I felt like a movie star in this look for some odd reason, but I definitely had fun wearing it. I decided not wear anything underneath my first velvet blazer. Bra-less and shirt-less and it felt great. I paired it with my edgy faux leather jogger pants, kitten heels, and a velvet quilted cocktail purse. A nice gold belt to cinch the waist in too was a good accent. Well, there you have it. My last wrap up of anything NYFW. I hope you enjoyed my looks from this season. There were a few accessory repeats, such as shoes, bags, hats, and sunglasses. I have no shame in my game of outfit repeats. I own the look like I never wore it in the first place and you should too! Thanks for reading!